This standalone hinged door is designed to be purchased in the project trim-out phase to complete installation of the structured wiring assembly. 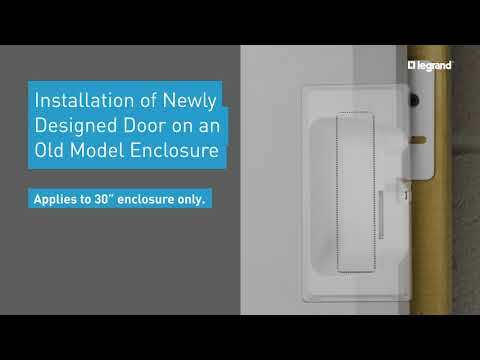 The door attaches easily to the ENP3080 plastic enclosure with provided screws and extra venting to allow for superior heat dissipation. Click here to learn more about the unique features that will save you time and simplify installation. Adds 1.2" of depth for cable headroom and 3rd party device compatibility. Extra venting along the vertical plane allows for superior heat dissipation. Doors stack efficiently for efficient transportation and warehousing. Covers drywall hole for clean finish.